Marion tinha um sonho. Desde os seis anos de idade, ela e o pai Walter Bartoli trabalharam juntos com um objetivo em comum, ganhar um dia um Grand Slam. Longe de ser uma celebridade hollywoodiana, como Maria Sharapova, ou número um do mundo e super campeã como Serena Williams, ou namorar um DJ de renome mundial como Victoria Azarenka, a francesa Bartoli também não é top 10, não é exemplo de corpo de atleta e muito menos joga um tênis tradicional. Mas, nada disso a impediu de se tornar a campeã de Wimbledon, derrotando na final a alemã Sabine Lisicki por 6/1 6/4. Não era a primeira vez que Bartoli alcançava a final do torneio mais importante de tênis do mundo. Foi vice-campeã em 2007, um ano depois da capitã da Fed Cup francesa, Amelie Mauresmo ter vencido no templo sagrado do esporte. Mas, diferente de seis anos atrás, hoje Bartoli parecia pronta. Desde o início do campeonato, pela primeira vez sem o pai Walter ao seu lado, com o sparring Thomas Drouet (ex-sparring de Tomic, aquele que apanhou do pai de Bernard, no torneio de Madrid e ficou desempregado), a capitã da Fed Cup, Mauresmo e todo o staff técnico da Federação Francesa de Tênis, Bartoli parecia estar serena e feliz com a decisão que havia tomado. Mais sorridente do que o comum e vibrando muito a cada vitória, parecia estar no caminho do seu sonho de menina, dpeois de um semestre dos mais conturbados. Sem o pai, no início do ano, resolveu tentar o circuito com diversos técnicos. Não durou mais do que 2 semanas com nenhum. Mudou diversas vezes. Chamou o pai de volta. Até que resolveu seguir caminho solo em um Grand Slam pela primeira vez. Se lesionou, ficou doente, abandonou jogos, perdeu partidas para jogadoras com níveis inferiors. Nada parecia dar certo na temporada da francesa. Até que chegou Wimbledon e a história todo mundo já sabe. Mesmo não tendo todas as atribuições de Serena, Sharapova e Azarenka, Bartoli com seus quilinhos a mais, sua esquerda e direita de duas mãos, o seu “shadow tennis – aquelas simulações de golpe que ela faz entre os pontos”, o seu saque estranho, os seus pulinhos antes do jogo começar, conseguiu cativar muita gente. Inclusive eu. Nunca fui muito sua fã. Mas, depois de acompanhar sua história e vê-la esses dias em Wimbledon, ver suas entrevistas e entender o que tudo isso significa para ela, fiquei feliz com o título nas mãos dela. Não vamos discutir o nível da final. Das 128 jogadoras ela conseguiu terminar como a única sem perder um jogo e sem perder um set. Não virou zebra precoce e permaneceu em Londres, quando todas as outras tenistas mais bem ranqueadas do que ela voavam de volta para suas casas. Para entender um pouco mais sobre esse sonho e a alegria de Bartoli, reproduzo aqui alguns trechos da entrevista coletiva da tenista de 28 anos. Q. How do you not get past the quarters in any tournament this year and win Wimbledon? MARION BARTOLI: Well, that’s me. I don’t know (laughter). Honestly, I didn’t think that way. I was just trying to play well every single matches, every time I was on the court. I was just, you know, trying to enjoy myself when I was having some off days. I was having some time off with my team. Even this morning I think a lot of people could hear us laughing. It was normally today where I was supposed to play the Wimbledon final, and really felt not like that. I think it will also make it even more enjoyable because I had so much fun throughout this whole championship. The whole two weeks have just been perfect. Q. Were you surprised how Sabine handled the occasion? MARION BARTOLI: Honestly, I didn’t think too much about how Sabine was doing. I was just trying to focus on my own game and try to remain calm, even if I had this 5‑1 lead in the second set and 15‑40 and couldn’t close it out. Then Sabine start to play very well and come back at 5‑4. I just really thought I had to hold my serve one more time. But just to finish on an ace to win Wimbledon and you saw the chalk come out of the line. Just, I mean, I could have seen it in slow motion. I could see the ball landing, the chalk come out, it’s an ace, and I just win Wimbledon. You can’t describe that kind of feeling. You cannot put any words what I feel in this moment. I can’t believe I won Wimbledon this year. We’ll have to see the pictures, to see the match again on DVD to kind of starting to realize it. Q. 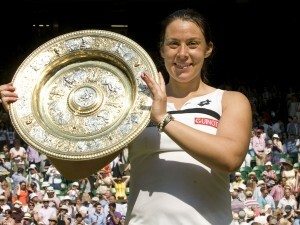 Everyone in the future when they talk about you are going to say, Wimbledon champion, Marion Bartoli. How much do you think it will change your life? MARION BARTOLI: It will not change me as a person because I will always remain the same: very humble, very low‑key and easygoing, down‑to‑earth. But just hearing ‘Wimbledon champion,’ that kind of sounds good to me (smiling). You know, has been my dream. I wanted that so badly. I felt the achievement of my career was to win a Grand Slam. Every time I was just saying my goal was to win a Grand Slam. It was like, yeah, dare to dream. I kept dreaming. I kept my head up. I kept working hard, and it just happened. Q. How many times you thought that your tactic, your strategy, all what you were doing, could look crazy, even if they weren’t at the end? Your father was pushing you to do many different things than anybody else we have seen. MARION BARTOLI: Well, yeah, it’s always been a part of my personality to be different. I think being just like the other one is kind of boring. I really embrace the fact of being a bit different and doing something that not everyone is absolutely doing. I actually love that part of my game, you know, being able to have something different. At the end of the day, when the spectators were looking at 10 matches they will remember this girl that was doing something different, playing inside the court or whatever. Even though today I was I think pretty smart to kind of back up a little bit to give me an extra maybe half a second or something to react to Sabine’s serve. Sometimes you have to adapt also, as well. But I never felt like I wanted to be like all the other kid and do exactly the same everyone was doing. Q. Could you tell us about your father’s influence on your tennis and maybe even outside the court, what it meant for you to climb up there and hug him today. MARION BARTOLI: Yeah, honestly it was an amazing feeling. I mean, I can’t still realize I just won Wimbledon. I can’t realize I’m a Wimbledon champion. It’s just so overwhelming. You know, I don’t know if you can really realize, but for a tennis player, you start to play like at five or six years old. 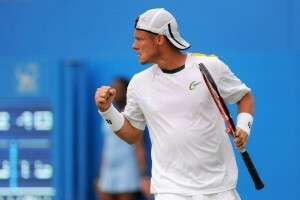 When you decide to turn pro, your dream is to win a Grand Slam. You dream about it every single day. You think about it every single day. So when it happen, when it actually happen, you felt like, you know, you achieve something that you dream about for maybe million of hours. You went through pain, you went through tears, you went through low moments, and actually it happened, once it happened. Those five, ten seconds before you shake the hands of your opponent, you felt like you’re almost not walking any more on earth. You’re really flying. It’s really hard to describe how it felt. So to share this moment with my dad, I was looking at him in the players’ box. He was really cheering me on. He was on his phone for almost the whole match. I don’t know what was happening, but he was really relaxed. That was the perfect day. It was sunny. It was beautiful. Centre Court Wimbledon, it was packed. I won in two sets. I didn’t drop a set for the whole championship. Even in my perfect dream I couldn’t have dreamed a perfect moment like that. That is beyond perfection. Q. You’ve been around for many, many years. The circuit is so challenging. So many setbacks, yet you’ve prevailed. Talk more about doing things your way. Is there a certain strength in that? Is it a challenge? MARION BARTOLI: Yeah, I’m a very tough person. I mean, I played the whole second set with probably a 25 cents blister under my big toe. I didn’t call for the trainer, and when I took my sock off the sock was red of blood. I didn’t call for the trainer the whole second set, even if I felt like I could barely walk at the end of the match. But I haven’t shown anything. I’m this kind of person. I can focus and be really as strong as wood, you know. You cannot see what I’m going through. I think it’s coming from my childhood, from where I practice when I was younger, from those very tough situation. I needed to handle going to school, normally practicing at 10:00 p.m., finishing at midnight, going back to school the next day. Those kind of hard moments makes me extremely strong when I’m on the tennis court. I’m not the same kind of person outside, but every time I’m stepping on a tennis court I remember those very hard moments. I could remember it today when I was playing on the court, and That carried me on a long way. Q. You said the other day about hitting rock bottom, and that’s going back to last summer when you missed the Olympics. Do those things make this even better? MARION BARTOLI: It’s not about missing the Olympics. It was more about what happened off the court for me. This year it was extremely hard to take. And, yes, to have now this kind of moment, I mean, I really didn’t expect it to happen so early, so quickly. But, it’s funny. I was with the physio before the match, and they saw me when I was really hitting rock bottom. They saw me before the match. I was smiling and listening to music, singing through the locker room. That was not supposed to be the perfect routine before going to play the Wimbledon final. I was so happy, why not showing it? They tell me, I remember you in Miami, how you felt after the match when you got injured with Andrea Petkovic. It’s so nice to see you like that no matter what happens in the final. But going through those hard moments makes this one even better. Q. What does the Bartoli sequence look like? How much further do you think you can go for the rest of your career? 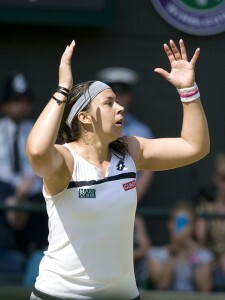 MARION BARTOLI: I have absolutely no idea, but one is pretty good for me. 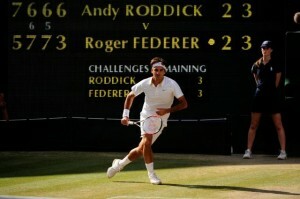 Wimbledon champ, even if I don’t get another one, I will still be very proud of it. But of course I’m going to try my hardest to get some more. Now that I get one, I definitely believe I can get more of them. I just want to enjoy this one because I haven’t still realized I’m really the Wimbledon champion 2013. So it will take me some few days to realize it. Actually when I will do, I will maybe think about the US Open and getting a shot over there. Q. Do you feel, having had this long journey, maybe not fitting the mold Federations look for in young players, you can be a support for young girls? MARION BARTOLI: I received a lot of support from my Federation. Seeing my president in tears waiting at the end of the match means so much for me. The vice president was here as well. They both told me I was an inspiration for all the girls in the French Federation. I actually received a lot of texts from them telling me how proud they were of me, how much they want to look at me now and have the same kind of attitude. Even if I’m not maybe playing the same style of game, I think the attitude I’m carrying on the court, the mental strength and everything, it’s maybe something they can look at. Disputada no dia 20 de setembro de 1973, no Houston Astrodome, contra Bobby Rigs, a “Guerra dos Sexos,”entrou para a história não só como o maior jogo de todos os tempos, com 31.000 pessoas na plateia e uma audiência na TV de 100 milhões, mas como uma partida que mudou para sempre o papel da mulher no esporte e além. 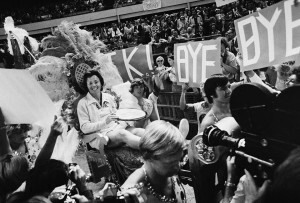 Billie Jean King venceu a disputa com Riggs por 3 sets a 0, em um jogo que foi altamente divulgado e comentado mundo afora. Imagina na época, nos anos 1970, nos Estados Unidos, no auge da luta pela liberdade feminina, uma mulher desafiar um homem? Foi notícia em todos os meios de comunicação possíveis, muito além do tênis. Eles apareciam nos mais diversos programas de televisão fazendo o “preview”do jogo, com Riggs dizendo que mulheres deveriam ficar em casa e que King não tinha chance alguma. Meses antes ele havia derrota Margareth Court por 6/2 6/1. 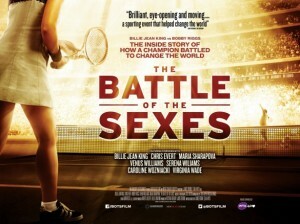 Desde que comecei a acompanhar tênis ouço falar da “Battle of The Sexes.” Li sobre o assunto, especialmente no livro de Billie Jean King, “Pressure is a Privilege,”em que ela conta os detalhes da preparação para a partida. Acabei de ler também o livro de Jimmy Connors, “The Outsider,”em que ele também conta passagens da “Battle of The Sexes,”até porque depois enfrentou Martina Navratilova e ganhou. Mas não foi fácil. O que eu nunca havia visto eram imagens em vídeo desta noite no Houston Astrodome. Hoje a gente vê um espetáculo como o BNP Paribas Showdown, no Madison Square Garden, ou o Nadal e o Federer jogando em uma quadra metade de grama, metade de saibro e acho que é o maior espetáculo de tênis da Terra. Engano. Nunca vi nada tão faraônico como aquele jogo em 1973. King entrou em quadra carregada por homens em um trono de realeza e Riggs, rodeado por mulheres. Os Estados Unidos pararam para ver aquele jogo. Talvez seja algo que nunca mais a gente vá ver no nosso esporte. A final de Roland Garros teve audiência mundial de 60 milhões na TV e estamos na era completamente digital. Nos últimos dias Billie Jean deu inúmeras entrevistas falando da Batalha e da fundação da WTA que completou 40 anos no dia 20. E o que ela mais enfatizou foi que ëu estava muito certa de que era sobre uma mudança social, não era sobre o hype e nem por causa do dinheiro” O campeão ganhou U$ 100 mil – valor impensável na época. 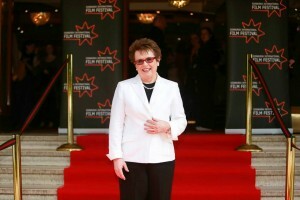 De lá para cá, Billie Jean King se tornou a maior voz do esporte feminino mundial. Fundou também a “Women’s Sports Foundation,”ganhou a medalha da liberdade do Presidente Barack Obama, em 2009, e continua a advogar pelas mulheres mundo afora. A premiere foi nesta semana em Londres, coincidindo, claro com a disputa de Wimbledon. Já entrei em contato como pessoal do filme para ver se há chance dele chegar por aqui. Mais do que divertido, levantaria novamente a questão da igualdade entre homens e mulheres, não apenas nas quadras. Como disse Billie Jean, hoje com 69 anos, isso me motivou muito naquela época. Para quem não é super fã de tênis, o diretor James Erskine afirma que não é um filme tenístico e sim um filme sobre a “luta dos direitos das mulheres por igualdade com os homens e como isso aconteceu em uma quadra de tênis. Quando chega esta época do ano, a de Wimbledon, alguns nomes do tênis nunca saem de moda e Goran Ivanisevic é um deles. O croata, campeão de Wimbledon em 2001, depois e ganhar um convite para entrar na chave principal, entrou para a história do Grand Slam britânico e no coração não só dos croatas mas dos britânicos também. Ele agora quer ver outro croata ganhar não apenas um, mas dois Grand Slams. Ao mostrar a emoção em quadra, chorar quando perdeu finais na quadra central do All England Club, dizer que queria se mater e comemorar como se fosse a coisa que mais importava no mundo, a vitória sobre Patrick Rafter na decisão de 2001 – e para ele era -, Goran chegou a ganhar até o apelido de “campeão do povo – people’s champion, numa final disputada numa segunda-feira – people’s Monday. Hoje, 12 anos depois, ele vive na Croácia e treina o juvenil de 16 anos Borna Coric, além de estar ao lado de Marin Cilic, sempre que possível, como nesta edição 2013 de Wimbledon. A temporada de grama começou assim que Roland Garros terminou, mas os olhos do mundo só se voltam mesmo para o tênis na grama a partir desta segunda-feira, quando a temporada mais longa da história neste tipo de piso tiver início, em Wimbledon. O mais prestigioso clube de tênis do mundo, o All England Lawn Tenni & Crocquet Club, sediará no período de 7 semanas o terceiro Grand Slam da temporada e os Jogos Olímpicos. Diferente dos torneios na terra batida, em que as atenções estavam voltadas para o duelo entre Rafael Nadal e Novak Djokovic, para ver que recorde seria quebrado em Roland Garros, agora as atenções se voltam de novo para Roger Federer. O suíço tentará igualar o recorde de Pete Sampras de sete trofeus, no palco onde obteve as suas maiores glórias. Recentemente em uma entrevista ele apenas disse que o objetivo para a disputa deste Wimbledon era ir além das quartas-de-final onde ele parou nos últimos dois anos. O heptacampeonato na Inglaterra poderia aproximar Federer (a última final que ele jogou em Wimbledon foi aquela histórica contra Andy Roddick) do posto de número um do mundo para ele então quebrar outro recorde, o de semanas na liderança do ranking mundial. Ele está a apenas uma semana de Pete Sampras (286). Apesar de Nadal e Djokovic estarem à frente de Federer e como vencedores das edições de 2010 e 2011, respectivamente, serem mais favoritos, em Wimbledon e na terra da Rainha, ele é sempre candidato a reinar novamente. Entre as mulheres, apesar da derrota na estreia em Roland Garros, Serena Williams e a irmã, Venus, com a saúde ainda frágil, sempre serão destaque. Juntas, elas tem 9 títulos em Wimbledon, 5 de Venus e quatro de Serena. Vice-campeã no ano passado, Maria Sharapova chega na Inglaterra tendo completado o Grand Slam, e confiante para tentar vencer novamente o primeiro dos quatro torneios que ela conquistou, há oito anos. Atual campeã, a checa Petra Kvitova não está tendo uma temporada como a do ano passado, mas ainda é a número quatro do mundo. Para rivalizar com ela, Victoria Azarenka pretende apagar a má impressão deixada em Roland Garros. É, o mesmo pretende Caroline Wozniacki, na terra do namorado Rory MclRoy. Wimbledon antigamente era conhecido como o torneio em que as grandes surpresas podiam acontecer, por ser disputado num piso em que mais da metade da chave não tem tanta habilidade. Mas, com a diminuição da velocidade da quadra nos últimos anos estas surpresas diminuíram. De qualquer maneira, é o piso onde todos estão mais suscetíveis. O caminho para o título já foi traçado com o sorteio da chave. Nadal abre a campanha contra o brasileiro Thomaz Bellucci; Djokovic contra Juan Carlos Ferrero; Federer enfrentando o espanhol Albert Ramos e Murray o russo Nikolay Davydenko. Entre as mulheres, menos suscetíveis a surpresas na primeira rodada – vamos esquecer o jogo entre Serena e Razzano há algumas semanas em Roland Garros – Sharapova enfrenta Rodionova; Radwanska joga contra Rybarikova; Serena pega Zahvalova Strycova; Kvitova joga contra Amanmuradova; Wozniacki desafia a austríaca Tamira Paszek, ex-pupila de Larri Passos e Azarenka joga contra a americana Falconi. O majestoso torneio de Wimbledon vai começar. Dentro de poucas semanas dois campeões e duas campeãs saírão do All England Lawn Tennis & Crocquet Club com o trofeu mais prestigioso do mundo e uma medalha de ouro olímpica.